Back in 2014, Candace Mumm was critical of councilmembers for suggesting the city council jobs should become full-time positions. Times change. The Salary Review Commission was meant to take the air out of the political football of city council salary raises. But this time, the opposite has happened. This week the commission voted to give a 44 percent raise to most of the council members, bumping their salaries up to $45,000. City Council President Ben Stuckart got a smaller raise to his larger salary, bringing his total to $58,630. The commission's decision has sparked criticism from former council member Mike Allen. Local conservatives are furious about it, with one local conservative activist attempting to start a referendum against the pay increase. City Councilman Mike Fagan — one of the beneficiaries of the big raise — raises that possibility that "we’re going to have to roll back salaries... because of the eruption we’re hearing from the public right now." He says he's torn. "A lot of the constituents I serve in District 1 are senior citizens on fixed incomes and or disabled members of the public," Fagan says. "I'm putting them before myself." The whole idea behind salary review commissions was that it would put the power to raise council salaries in the hands of someone other than the council. "I have zero power over what the salary review commission does, but we get raked over the coals," Stuckart said Tuesday. "And I have zero power over what my salary is... It makes me angry we have to deal with this [controversy] every two years." Minutes from the commission meetings, however, show that most council members implicitly or explicitly laid out the case that they were overworked and underpaid when answering review commission questions. And in some cases, their arguments they made in 2016 were significantly different from statements they were making in 2014. Other than Fagan, who told the commission "he did not expect a 4 percent increase previously given but did appreciate it," and that he's had concerns about an "increasing council budget," the members this year stressed how difficult and time-consuming their job was. 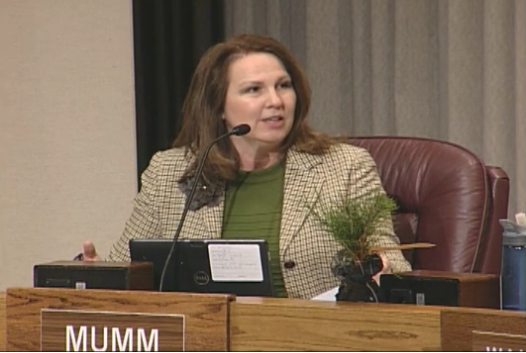 Minutes show council member Amber Waldref saying the "the financial impact was big and [her] husband works full time. After six years, it is a challenge; other jobs with this level of time and attention pay a lot more per hour. Working hours have to be limited as they are not justified without retirement being matched like others. Waldref indicated she has asked about continuing especially with daycare and other issues." Karen Stratton "indicated the salary has been a hardship; she has been with the City since 2005 and the salary almost made her not want to do this work but she knew she would be good at the work so she made that sacrifice." Council member Lori Kinnear suggested "she expected a 40-hour workweek but is experiencing a 50-60 hour workweek as citizens expect a response immediately." Stuckart was the most explicit in his interview, with minutes saying "he almost didn’t run and would be making six figures in the private sector and had offers already" and that "he is underpaid for the responsibility he has." He said the city council had lost two members because of the low salaries. "The salary can hinder someone applying and hurt the quality of candidates running," he said, according to minutes. "The pay is low enough and a detriment to candidates." But contrast those statements with Oct. 2014, when in the middle of lambasting a pay hike for the mayor's (larger) salary, Stuckart said he'd "never wanted for anything" on his $55,000 salary. Traveling back in time to 2014 is particularly instructive for the debate over the city council roles and salaries. The issue came to a head at a tense council briefing session that April. Allen and then-Councilmen Steve Salvatori wanted to put advisory questions on that November's ballot, asking voters if they think council members should be full-time or part-time. To Salvatori and Allen, the council was experiencing serious "mission creep," their limited role expanding, inch-by-inch, year after year. Thanks to council raises, and expanded roles for legislative aides, the council budget had grown by 43 percent in 8 years to nearly $1 million. And now, the councilmen argued, members' jobs seemed to be gradually assuming full-time roles, without the voters ever having a chance to weigh in. "They want to just ooze on to full-time, spending hundreds of thousands of dollars, and they're too busy to ask the citizens?" Salvatori told the Inlander then. Why does this old debate matter now? Because from the very beginning of the Salary Review Commission, the question of whether council members should be considered full-time or part-time has driven their discussions. In 2008, commissioners looked at "comparable part-time elected positions available to Spokane city residents" to justify salary raises for councilmembers. In 2010, commissioners interviewed current and former councilmembers. Current members said they were working more than 40 hours a week. But "former members said that the job as council member should be part time and that council members could spend an inexhaustible amount of time attending meetings and constituent event requests." They were worried larger salaries would make the job less of a public service job and more of a professional politician job. For years, the city council role carried the informal reputation of being a part-time job with full-time demands. "This is a bigger than a full-time job masquerading as a part-time job," Councilman Jon Snyder said in 2013. "It takes time and effort and energy and hours to do it effectively." While she didn't call it "mission creep," Kinnear told the commission that the role of the city council had changed. She "indicated that she began as a legislative aide over seven years ago and has watched the progression of the office and how councilmembers have done their job. Councilmembers now treat their job as full-time and citizens expect more than the minimum." In their meeting the first week of March, the two commissioners who'd been on the panel since 2014 wanted to put salaries at $34,000, with Alexander Scott arguing that while employees were working long hours, the job "hasn’t changed in 14 years" and chair Bob Beaumier arguing "that the positions have always been considered part time." But the new commissioners — Jeff Rugan, Christy Jeffers and Mark Bryant — all wanted to raise salaries considerably higher, with Rugan and Bryant specifically citing the argument that the city council jobs were full-time positions. But given a chance to assess the full-time/part-time question back in 2014 — or put it in front of the voters — Snyder and Stuckart pounced on Allen and Salvatori, arguing that even discussing the question was a waste of time. You can watch the exchange here, starting at about 25 minutes. But throughout the discussion, Stuckart seems irritated at the idea being brought up at all and repeatedly interrupts Allen and Salvatori as they talk. “Since you’ve brought this and dropped it on the docket, there have been three different newspaper articles, and I’ve received five different calls on this, and it’s become the topic of conversation,” Stuckart said. "I think the topic of conversation over the next six months needs to be parks and streets and not whether I'm full or part time." Allen called this a "red-herring" argument. But Snyder was even harsher. Mumm, meanwhile, was unequivocal that they all had run for a part-time position and she didn't want to turn it into a full-time position. The council — four to three — voted to, officially, defer the issue for a year. But nearly two years have passed, and the measure has never come before the council again. Two years later, however, Mumm wasn't telling the Salary Review Commission that she considered her job part-time. Instead, meeting minutes show that this year, she "indicated that she was discouraged in the past from running and couldn’t afford to run before. She said had to take on extra work now to supplement her income." She talked about how "some Mondays are 12-14 hour work days and other days she will have a meeting at 7 am and a meeting at 7 pm." And her legislative aide, former council member Richard Rush, was among the citizens who testified "indicating that the jobs were a full-time job and should be compensated accordingly." Today, she tells the Inlander, that more experience on the council changed her mind. She had to make changes in her life to make the job work. "At the time in April , I was personally not interested in this being a full-time job," Mumm says. "Now that I have served, it clearly is not possible to have a regular part time job on the schedule." Snyder, similarly, says his opinion had changed. He thinks his wife and kids played a part in changing his mind. "When you have so many demands like that, family ends up suffering. That was hard," Snyder says. "I thought I could do it all. When you miss that time with your kids you kind of never get that back." Snyder says the low salary wasn't the only reason he left the council, but says it probably had an influence. In a press conference Tuesday, Stuckart said that the part-time/full-time formulation is a "silly question." "I don't believe that it's possible to do this as a part-time job," Stuckart says. "Unless you are making uninformed decisions, not attending to the needs of the citizens, or just straight not attending [board meetings]." Compared with full-time salaries in the mayor's office, he argued, the council salaries are minimal. A division communication manager position, for example, starts at over $73,000. "It makes me angry when are 34 people in this building making over six figures a year," Stuckart said. "Yet we have people that are getting complained about for making $45,000 for working for the citizens a lot harder than most of those people making six figures." Stuckart suggests it would be simpler for council salaries to automatically rise with inflation. "If I were in charge of the world right now, I'd say, boom, set it, and it would be taped to [inflation] for the city of Spokane," Stuckart said. But in the part of the world he is in charge of — the city council — he said he won't move to try to pass council legislation to make that happen. "I'm not going to give this any more time than I just did," he said at the conference. Stuckart may have to spend at least a little more time on the issue. Fagan says he may introduce legislation to improve the salary process once the initial controversy dies down. "Who the hell do you know that has gotten a 44 percent raise?" Fagan says. "We’ll get through this week, and then see what’s going on with the public sentiment." What is a City Council Worth? The Spokane City Council's budget is growing. Some say it's a sign of increased productivity; others call it "mission creep"